Thinking Outside the Box: Solid Cologne Has Got You Covered! 1. The Wrist is the most common place to apply a solid cologne, and a starting point to make an impression. If you are a person who has yet to try a solid fragrance, this would be a good place to start. And although it is not the most unique item on this list, it can be a building block to help you get comfortable with using solid fragrance instead of liquid fragrance, and can inspire you try different parts of your body. To apply, start by swirling a finger in the cologne, and then rub onto the inside of both of your wrists. And that’s it! How easy is that? Also, wrist application of this solid cologne will make impressions. Think about it- you shake hands with people, you pick up things, you play sports, and eat. In practically every daily activity you directly and indirectly use your wrists. After swirling your finger in the solid cologne, transfer or apply the fragrance to your wrist or forearm. If you are having a hard time deciding on a fragrance, go with the “Very Manly” solid cologne. It was the very first fragrance in the Aromi men’s collection, and continues to be the most popular. A benefit to using a solid cologne is that the level of fragrance is easily controlled - continue application on the wrist until the desired level of fragrance is achieved! One thing to keep in mind when applying to the wrists, is not wash it off when washing your hands. If enough hand soap reaches the area where the solid cologne was applied, the soap can actually remove the cologne. 2. The Neck is another traditional spot that is targeted with liquid perfume and can also be applied by cologne in solid form. 3. Applying to all the pulse points on your body ties up the first two ways to wear solid cologne nicely. It turns out, the pulse points are the best places to apply solid fragrances because of the warmth of your blood caused by your heart rate. Once the scent is applied to skin, it takes about 30 seconds to warm up to the same temperature as your skin. As the fragrance is going through this process, it is released from your body and in turn creates a signature scent that everyone around will detect because of the unique mixture of the original fragrance of the cologne and your personal body temperature and chemistry. If you are unsure of where your pulse points are, here are a few of the main ones: your wrists, on neck, inside of elbows, behind your ears, and behind your knees. 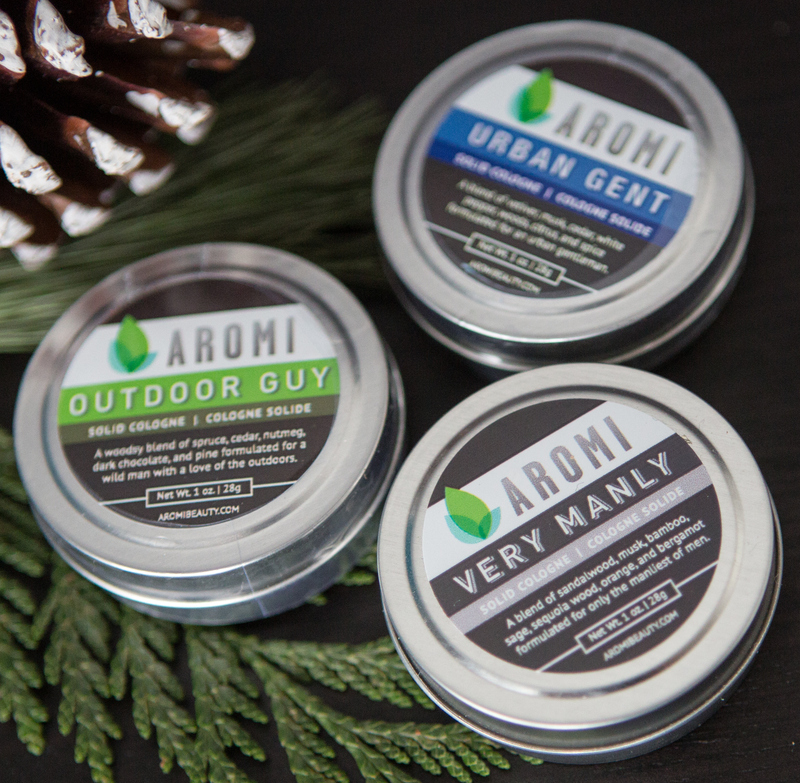 The best-selling Aromi solid colognes are Urban Gent, Very Manly, Outdoor Guy, Handsome, and Sweet Dude. 4. Men’s solid fragrance can be used as a beard or mustache conditioner… yes really! This is one of the more unique ways to use solid cologne, and one of the more practical ways as well. The natural oils that reside in solid fragrances will condition and soften facial hair! Once you purchase a product such as this, you will always have a convenient way to have healthy facial hair. Aromi solid colognes are cruelty-free meaning there is no animal testing on any of the raw materials or any animal testing on the final product. 5. Solid cologne can be used as a cuticle cream to treat and soften the layers of dead skin around your nails. Are you a person who works with your hands at a construction site, woodshop, or at car garage, and seem to have hangnails/dead skin around your nails all the time? Now you won’t have to worry about bringing cuticle cream with you on the go. The only thing you will need is the solid fragrance of your choice that comes in a one-ounce jar. Its compact size is convenient to quickly apply to the skin around your nails. 6. Hair wax is yet another unique usage that this men’s cologne can perform. Having a bad hair day, or is your hair looking a little too rugged? Now you will be able to quickly tame those little flyaway hairs by using your new solid cologne as a light hair wax and leave that “I’ve been living in the woods for two weeks” look behind you forever. And even better, the cologne will doubly act as a pomade, making your hair smell amazing! 7. Using solid cologne instead of hand lotion can treat and keep hands moisturized. Hand lotion that is used to treat dry hands has been known to not continually moisturize skin after the lotion is absorbed. Why is this? This is because water is one of the ingredients in hand lotion, and it could hurt and not help keep dry hands moisturized. Unlike hand lotion, solid cologne can be used as a hand salve that does not contain water, so it will continually moisturize hands after it absorbs. 8. Solid cologne cannot just be used to treat dry hands, but can be used to treat dry skin all over the body! This men’s product will work great to moisturize skin, especially in areas that tend to become more dry than other parts of the body. For example, you can apply to elbows, knees, etc. Solid fragrance is great for treating dry skin patches! Each solid cologne contains jojoba oil, castor oil, lauryl laurate, and olive oil which work in combination to help dry skin. And finally, solid cologne can make a great Father's Day gift! If you are currently not looking for something for yourself and instead researching for the best Father’s Day gift to give, look no further than Aromi Beauty for a men’s cologne to find the perfect scent! There are fun names and different scents to choose from, creating a great personalized gift. Having a product that is multi-purpose will be very appealing to any man! Now until Father's Day, use code: FATHER for 20% off any of our men's products - including solid and liquid colognes. We also offer gift wrapping that can be purchased for $5.00 at checkout! We can wrap your Father's Day Gift and can even customize a message for the gift tag.